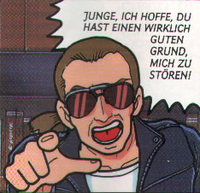 Max Milliplatt is a character that appears in the Club Nintendo comic "Super Mario: Coole Klänge". He is the boss of the record company Koopa Records and signs Mario on, despite the fact that Mario obviously is not a good singer. When he flops, Milliplatt tries to put Mario in a different outfit, without success. Milliplatt seems to be the stereotype of a big record company boss who does not care about the artist but just about earning money. He has a secretary called Mona and is angry with her when she does not manage to stop Mario from entering Milliplatt's office. It is briefly mentioned that Max Milliplatt produced his greatest hits with Mario Paint. Milliplatt's name might be a pun on "million" and "Platte" (German for "record"). In the reprint of "Coole Klänge" called "Super Mario: Die Blume meines Herzens", Milliplatt was not referred to by his name. This page was last edited on March 25, 2018, at 11:43.